John Dean: If you’ve got 20 years or more until retirement, your 401(k) probably has – and probably should be – close to 100% Aggressive growth. So when you put money into your 401(k) at that age, it’s gonna go across the board into that volatility. 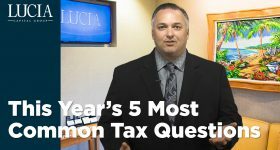 Rick Plum: Your allocation of your existing funds and the allocation of the contribution that’s going in every pay period, is the same. 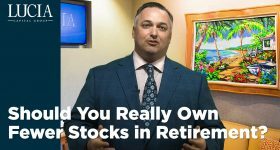 Whether it’s one fund because you’re putting in $50 a month or it may be five, six, or 10 funds because you’re putting in $1,000 a month and you’re spreading it out into a more diversified growth portfolio. John Dean: Let’s say you’re 60, you’re gonna retire in a couple of years. First thing you should look at is that allocation. 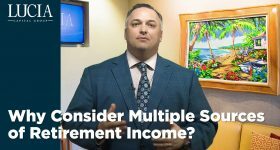 You would probably suggest – and I think common sense for many people suggests – that they should not, at that age, have their entire 401(k) in a pure growth investment. Rick Plum: Most people understand the concept. As they get closer to retirement, they change the portfolio to be less volatile. They change the portfolio to protect against the big downswings that may happen. They go to more balanced portfolios. They start shifting their allocation from pure growth to more bond-oriented, balance oriented type of investments where we can still have some volatility. We just don’t want huge volatility. And as we get closer yet to that time horizon and may move it into the stable value fund, because we need some money that we can rely on. If we need $20,000 from our portfolio in 2 years, we need it to be $20,000. we don’t want it to be $18,000. We don’t want to have to say “Well, it’s gonna recover soon.” And we’re willing to give up the fact that it’s not gonna grow tremendously to make sure that it doesn’t go down tremendously. So we naturally shift our portfolios to a lesser volatile state. Unfortunately when people do that, they change, their allocation. So now, maybe we wanted to have 20% of our portfolio in that stable value fund, 35%, 40% of it in a balanced fund, and the rest of it in a pure growth orientation. That’s what our strategy called for. John Dean: In other words, some safer assets – a lot less volatile – you have some that are a little more volatile, and others, like before, that are probably quite volatile. Rick Plum: And so we then change our allocation of our contribution, 20% to the safe account, 30, 35% to the balanced account, the rest to the growth account. But we’re not getting any advantage. We know that there’s going to be volatility. We know there’s gonna be good days and bad days. Some people will say, “Well, I’m gonna stay 100% equity and I’m just gonna change my contribution to the stable value fund. And I’ll build that stable value fund over the last five years that I’m working until I build it up.” There’s no advantage that the market will give us in that. Where does that systematic contribution give us our biggest bang for the buck, in the safe area that’s gonna earn 2%, 2.5%, 3%? Or in the volatile area that’s gonna be up and down like crazy on any given week, every given week, every given month, but over the next 10 or 15 years should do very well? Am I going to spend the money that I’m saving over the next 5 years between 60 and 65? Am I going to spend it right at retirement or do I have other money set aside? My opinion is you set other money aside, and you continue funding into the growth-oriented areas to take advantage of that one thing that we know is gonna happen: volatility. Use it and let it work for you. Don’t just put your money into safe accounts on a systematic basis. Sure, allocate the existing assets the way it needs to be, but take advantage of the market. But then when you do start taking money out, be aware of the market. 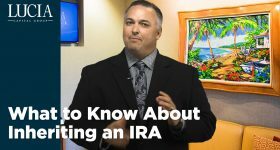 Rick Plum is a registered representative of, and offer securities through, Lucia Securities, LLC. John Dean is an associated person of Lucia Securities, LLC.